In an effort to reduce incidents of distracted driving in Pennsylvania and promote safe driving, Rep. Rosemary M. Brown (R-Monroe/Pike) is sponsoring House Bill 1684, which was approved by the House Transportation Committee on Monday with a bipartisan vote. Brown’s bill would prohibit the use of hand-held mobile telephones and similar devices, except with the use of hands-free accessories, while operating a motor vehicle. 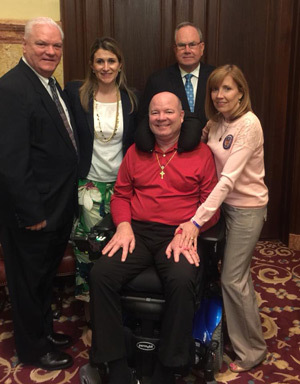 Following the committee meeting, Brown met with Paul and Eileen Miller, who have been tremendous advocates for this legislation, after they lost their son, Paul, on State Route 33 in Monroe County due to distracted driving. We are pictured here with House Transportation Chairmen John Taylor (R-Philadelphia) and Bill Keller (D-Philadelphia). HARRISBURG – In an effort to reduce incidents of distracted driving in Pennsylvania and promote safe driving, Rep. Rosemary M. Brown (R-Monroe/Pike) is sponsoring House Bill 1684, which was approved by the House Transportation Committee on Monday. Brown’s bill would prohibit the use of hand-held mobile telephones and similar devices, except with the use of hands-free accessories, while operating a motor vehicle. Under Brown’s legislation, all motorists age 18 and older would be prohibited from using a hand-held phone while the automobile is in motion. Additionally, drivers under the age of 18 would be prohibited from using both hand-held and hands-free devices. An added amendment established the presumption that if an individual is holding his or her device while the car is in motion, he or she is presumed to be using it. Law enforcement officials are also able to cite an individual for an additional $25 distracted driving penalty when that individual has also been cited for careless driving. The first offense for violating this law would be $50 and two points to a driver’s license and $100 for a second or each subsequent offense. The northeastern region of the United States – including New York, New Jersey, Connecticut, Maryland, Delaware, Vermont, New Hampshire and West Virginia – all ban hand-held cell phone use. Sixteen states in total ban hand-held cell phone use, including Georgia which also passed legislation this week. The bill was also amended to add a requirement that the parent or guardian of a minor would have to certify that he or she has viewed educational material about the dangers of distracted driving before taking their driver’s test. The Driver Distraction Awareness Fund would be established through this legislation, where collected funds will be used for safe driving educational programs. The bill has now been sent for consideration by the entire House. For more information about this legislation, or any state-related issue, contact Brown’s district office in East Stroudsburg located at 143 Seven Bridge Road, by calling 570-420-8301. Information can also be found on online at RepBrown.com or Facebook.com/RepRosemaryBrown.